Lake Front Cabins is located in the June Lake village, next door to the June Lake Marina across the street from June Lake. Walk to June Lake and Gull Lake. Hiking and bicycling from our property. A short drive to Yosemite, Bodie, Mono Lake and countless other lakes, streams and natural wonders. 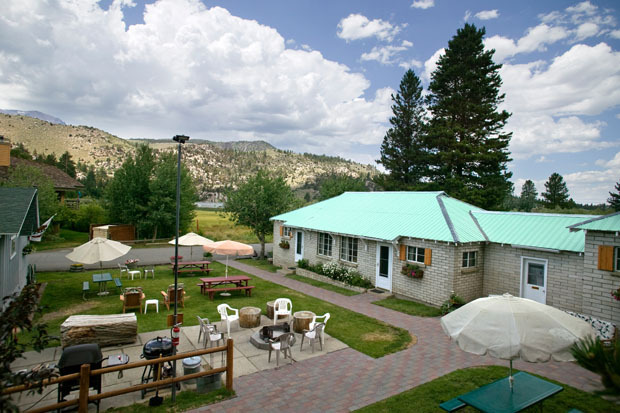 Family-friendly housekeeping cabins equipped with kitchens, bbqs, campfire & large grassed picnic area overlooking June Lake. Free wifi secured with a password. Sorry, no pets. DISCOUNT JUNE MOUNTAIN LIFT TICKETS: We are offering discount June Mountain lift tickets to Lake Front guests. If you are booking at least 7 days prior to your first ski day, we can offer up to 40% off the June Mountain window price for multiple day lift tickets. Call us!